Randy Secatero and his wife, Sylvana Apache live in Tohajiilee, New Mexico. Sylvana Apache is a member of the Navajo Tribe and the Mescalero Apache tribe. Randy Secatero is a member of the Navajo tribe from Canoncito NM. 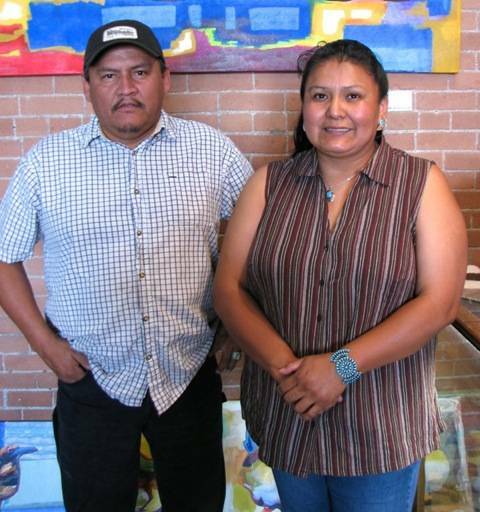 Randy and Sylvana create beautiful copper and silver jewelry that is stamped with traditional Navajo designs. Sylvana also does inlay pieces that Randy creates the silver work for her amazingly detailed inlaid jewelry and knives. Randy learned his craft from his mother, Dorothy Secatero. Sylvana is always on the look out for stamps when they travel and collects old Navajo stamping tools. Together they make a great team and great jewelry.